The FCC's Technology Transitions Policy Task Force (Task Force) authorized a 6-month trial to examine providing interconnected VoIP providers direct access to telephone numbers. The goal is to speed the transition away from TDM to all-IP infrastructure while ensuring resiliency. First, the FCC is seeking comment on a VoIP interconnection trial that would gather data to determine whether there are technical issues that need to be addressed and gather information relevant to the appropriate policy framework. Second, regarding migration of the nation’s emergency calling (911) system to Next Generation 9-1-1 (NG911), the FCC is seeking comment on a trial that will assist the Commission, state, local and Tribal governments, and Public Safety Answering Points (PSAPs) in a few geographic areas to answer important technical and policy questions to accelerate the transition. Beyond NG911, the FCC is also seeking comment on how a trial could elicit data on the impact of network resiliency and public safety more broadly as consumers migrate to wireless and IP-based services that are dependent on commercial power. Third, because at least one provider has proposed serving consumers with wireless service in place of wireline service in certain geographic areas, the FCC is seeking comment on a trial that would analyze the impact of doing so and, in particular, focus on the consumer experience and ensure that consumers have the ability to move back to a wireline product during the trial. "Trials are a smart approach that we have deployed before. Transitions to modern fiber and IP-based broadband networks, and the increased deployment of wireless technology, have the potential to unleash substantial economic benefits for our country, and advance national priorities like education and health care. The ongoing transitions must be handled in a way that advances the Commission’s vital longstanding goals of competition, universal service, consumer protection and public safety," stated outgoing FCC chairman Julius Genachowski. Jerry James, CEO of COMPTEL, stated: "The most critical aspect of the transition of the PSTN to IP technology that needs to be addressed is interconnection between competitors and the ILEC on an IP basis for the purpose of exchanging managed voice traffic. COMPTEL believes Commission affirmation of competitors’ interconnection rights on an IP basis under the Act, which we initially asked to be addressed in 2008, would achieve the new, innovative services it wishes to unleash at a faster pace than a trial. Nonetheless, COMPTEL believes the outcome of any trial on the transition to IP should include an IP-to-IP interconnection arrangement that complies with the standards set forth in the Act and will be available for opt-in as part of interconnection agreements." 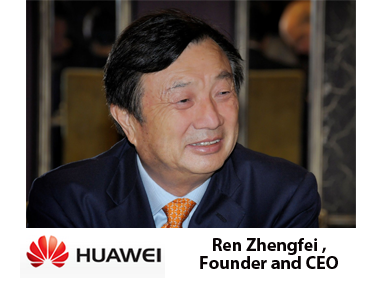 Huawei issued comments from its CEO and Founder, Mr. Ren Zhengfei following his first ever press briefing outlining the company's business ambitions and global cyber security challenges. Huawei will not go public in the next 5-10 years. "As a leading global company, Huawei attaches great importance on cyber-security," Mr. Ren said. "Cyber-security is a significant challenge facing our industry globally today. The solution must involve governments, telecommunications operators and ICT companies, including Huawei and our peers, as well as end users coming together to take collaborative, solutions-oriented, multi-lateral approaches to mitigate the risk." "Huawei equipment is almost non-existent in networks currently running in the U.S. We have never sold any key equipment to major U.S. carriers, nor have we sold any equipment to any U.S. government agency. Huawei has no connection to the cyber security issues the U.S. has encountered in the past, current and future." 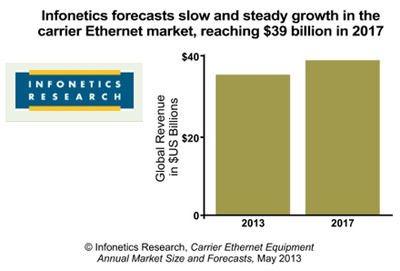 The global carrier Ethernet equipment market declined 3% to $34 billion in 2012, following a 13% spike in 2011, but is forecast to grow to $39 billion in 2017, according to a new report from Infonetics. Asia Pacific currently accounts for the greatest portion of carrier Ethernet equipment revenue, followed by EMEA (Europe, the Middle East, and Africa); by 2017, Infonetics expects North America will have passed EMEA to become the 2nd largest carrier Ethernet market. Infonetics projects Carrier Ethernet equipment ports will top 95 million worldwide by 2017, with 10 Gigabit Ethernet growing fast to pass 1 Gigabit Ethernet. The decline in underlying revenue excluding transit this year reflects lower revenue from calls and lines, the tough conditions in Europe and the financial services sector and regulatory price reductions. "We are doing what we said we would do. In an environment where it is easier to focus only on the short-term, we are investing in our future and delivering growth in profits and dividends. We are driving fibre across the UK, launching high quality sports channels, investing in the high-growth regions of the world and will use our wi-fi capabilities and 4G spectrum to make sure our customers will be the best connected. We have created around 3,000 new jobs in the UK over the last year to support these investments. 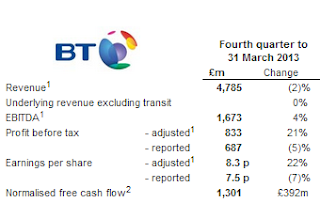 "Our focus on improving efficiency across the business will allow us to continue to deliver strong financial results whilst making these investments. 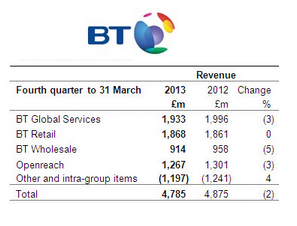 Our good performance this year is reflected in our dividend which is up 14% for the year. Primus Telecommunications Group agreed to sell its North American retail telecommunications operations to affiliates of York Capital Management, for approximately US$129 million. PTGi's retail telecommunications operations in Canada provides international and domestic long-distance voice, local, broadband, Ethernet, hosted-VoIP and wireless services to SMEs, residential customers and government agencies. In the United States, PTGi provides international and domestic voice, data, business-class broadband, hosted IP-PBX, SIP trunking and VoIP services to SMEs and residential customers, and sales personnel offer business customers voice, data and hosted IP-PBX services. Neil S. Subin, Chairman, stated, "This transaction represents a meaningful outcome of the board's strategic process. The Board is considering alternatives for the deployment of the proceeds from this sale." PTGi (Primus Telecommunications Group, Incorporated), which is based in McLean, Virginia, owns and operates its own global network of next-generation IP soft switches, and media gateways. Founded in 1994, PTGi is headquartered in McLean, Virginia. Clustrix, a start-up based in San Francisco with branch offices in Seattle and London, raised $16.5 million in funding for its scale-out SQL database engineered for the cloud. In April, the company released Clustrix 5.0 on Amazon Web Services (AWS). The AWS offering is the next step in the company’s cloud strategy, following database-as-a-service announcements with Rackspace, GoGrid, Equinix, and BlueBoxGroup. Clustrixsaid it is able to achieve a 50x performance advantage compared to legacy scale-up databases on AWS. The funding round was led by current investors Sequoia Capital, U.S. Venture Partners, ATA Ventures, and Don Listwin. The company has raised $46.5 million to date in three rounds. 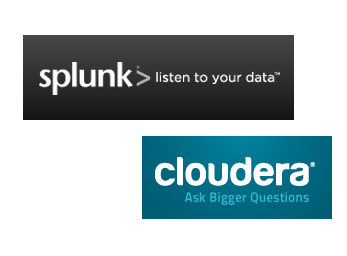 Splunk and Cloudera, which specializes in Apache Hadoop in the enterprise, formed a strategic alliance for big data analytics across the enterprise. The alliance ensures bi-directional integration to easily and reliably move data between Splunk Enterprise and Hadoop. Nokia Siemens Networks is rolling enhancements to its intelligent Self Organizing Networks (iSON) to help operators manage self-configuration, self-optimization and self-healing. an Automated WCDMA Site Creation content pack, which extends the LTE version launched in February 2013. The content pack gives operators full visibility of the automated configuration of 3G sites, with regular status updates for engineering personnel. The time needed for base station configuration can be reduced from hours to minutes. Security for LTE networks -- security certificates are factory installed in the base station and configuration of the authenticated base stations in the operator network is fully automatic as part of the SON auto-connection and auto-configuration process. New Mobility Management for LTE content pack, which provides support for seamless configuration and follow-up of SON operations related to LTE mobility management through a single interface. The new content pack reduces the set-up time for SON operational processes from 30 minutes to 5 minutes, and also provides full control and visibility of the automated process. A New Element Outage Resolution content pack, which controls the automatic resolution of network failures in LTE, WCDMA and GSM networks. The self-healing capability detects base station outages and dormant cells and triggers common resolutions, such as restarting an element to re-establish connections. A full set of professional services, ranging from customization to full outsourcing from our global delivery centers, to integrate iSON capabilities and the related content packs in operator networks. “Automation is important to simplify network operations, and these extended functions now make the deployment and use of automation easier than ever. The enhancements give operators visibility on the impact of automated processes on network performance – and provide clear evidence that all network changes are working as expected,” said Peter Patomella, head of the operations support systems (OSS) business, Nokia Siemens Networks. Peter Blackmore, president and CEO of ShoreTel, announced his intention to retire as soon as a successor is announced. 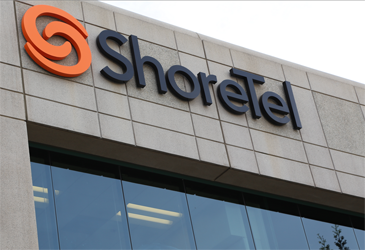 "It has been a privilege to work with the ShoreTel team,” said Mr. Blackmore. "I am confident that the company is well-positioned in both the cloud and premise unified communications markets. With recent changes to our organizational and cost structure, we can now scale with a model positioned for profitability, enhancing our objective of delivering improved shareholder value."